From October 2018 the wormer brand, Equitape®, commonly used to treat tapeworm infection will be discontinued from sale in the UK. This wormer is the only licenced product for horses containing praziquantel as a single active ingredient. Going forward it will only be available in ‘combination wormers’ also containing either ivermectin or moxidectin, the drugs most commonly used to treat small and large redworm (strongyles). Equitape’s removal from the portfolio of veterinary medicines available to target specific worm infection presents a challenge to prescribers and horse owners alike. Two leading laboratories; Westgate Labs, postal worm count specialists, and Austin Davis Biologics, manufacturers of the innovative EquiSal tapeworm test, are therefore responding to this news to stress the increasing importance of evidence-based control in managing worm burdens in horses. In partnership with Professor Matthews, Royal College of Veterinary Surgeons Specialist in Veterinary Parasitology and Parasitology Expert on the UK Veterinary Products Committee, they have set out to develop “best practice” recommendations to minimise the impact of the impending change in wormer products available for tapeworm treatment and control. 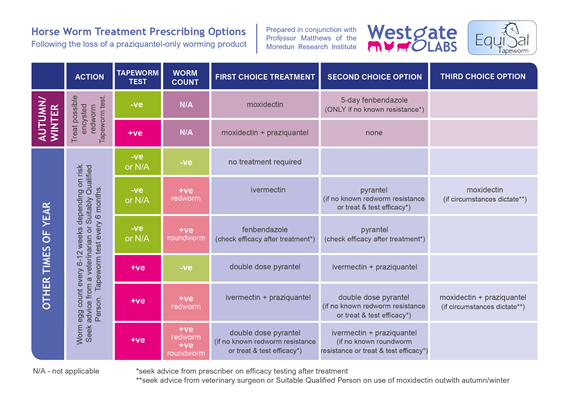 Quick link to Horse worm treatment prescribing options table. Professor Matthews commented: “I think it’s an issue to limit prescribers’ options for worm species-targeted treatments. Wormer resistance is a growing problem and has the potential to become a major horse welfare threat. Losing the option of a praziquantel-only product means that any treatment option for tapeworm infection will now also impact redworms, whether required or not. Frequent drug exposure speeds the development of resistance and, over time, has potential to significantly decrease the effectiveness of the few chemicals that we have to treat life-threatening worm burdens in horses. Regular testing should form the centre of any programme to determine whether or not a worming treatment is required to keep drug exposure to a minimum. Strongyle worm egg counts should be conducted every two-three months (with frequency depending on risk) and tapeworm tests performed every six months to monitor infection levels in healthy adult horses. Lester & Matthews (2013) identified that: “Faecal egg counts can be used to identify the likely 15-20% of horses that need worming to reduce strongyle worm egg shedding and can reduce wormer use by up to 82%”. EquiSal tapeworm test data suggests that fewer than 27% of horses tested require treatment for tapeworm (Austin Davis Biologics) and Lightbody et al (2017) demonstrated that using EquiSal Tapeworm in a targeted worm control programme reduced the use of tapeworm wormers by 86%. The statistics serve to show just how effectively a diagnostics-led worm control programme can minimise exposure to wormers. The exception to evidence-based control is treatment with moxidectin in late autumn/winter to target encysted redworm and large redworm larvae, which can’t be detected using worm egg count methods. Testing for tapeworm prior to the annual treatment for encysted redworm in late autumn/winter is an easy win. This will help to decide whether a moxidectin only (or where there is no resistance known, a 5-day fenbendazole) treatment is required or if a moxidectin + praziquantel combination wormer is advised to include treatment for tapeworm at the same time. At other times of year where it has been confirmed that treatment for tapeworm is needed, a worm egg count should be conducted. If treatment for redworm is indicated at the same time, then an ivermectin + praziquantel combination wormer should be the first choice. - the redworm population in question is known to not be resistant to pyrantel. As a note of caution, in studies conducted by at Moredun Research Institute, small redworm resistance to pyrantel was found on up to 50% of yards, depending on the group of establishments tested. Wherever possible, use of moxidectin should be preserved for targeting encysted stages of redworm and large redworm larvae in late autumn/winter. This wormer is the most effective for treatment of these dangerous larval stages capable of causing life-threating colitis or colic. Additional use is only recommended in exceptional circumstances when an experienced prescriber considers it appropriate; for example, a second winter treatment in horses grazed outside in winter, particularly youngsters, or those on poor/over-grazed paddocks at high stocking density. Worm egg counts should be carried out through the winter months in such populations to support treatment decisions. Keep in mind, the strongyle worm egg reappearance period in dung after moxidectin treatment (12 weeks +). Worm eggs detected before 12 weeks warrants caution as this may be an indication of early resistance. If this happens, seek advice from your prescriber. Each horse owner or yard manager should be working closely with an experienced prescriber to design bespoke worm control programmes for the horses in their care. Once the most appropriate treatment for the situation has been selected, it must also be correctly and carefully administered. The most common error is under-dosing, either because the weight of the horse has been under-estimated or because of spit out. Under-dosing doesn’t appropriately treat the burden present and serves to speed the development of drug resistance. There are many variables to take into account when putting together a parasite control programme for a horse or group of horses. An experienced prescriber such as a veterinary surgeon, an SQP in your testing laboratory or store, or an equine pharmacist, will not only be able to advise on wormer selection but also put together a strategic plan to manage this important aspect of horse health. A consultation should cover information such as the age range and health status of each of the equines, the way they are kept, pasture maintenance and relative risks of worm infection. This will help to produce a detailed guide of which tests and treatments to carry out when to protect against endemic disease as well as checking and managing the growing problem of drug resistance. Lester, H., Matthews, J. (2013) Equine Vet. J. 46, 139e145. Lightbody, K. L. et al (2017) Equine Vet J, 50: 213-219.